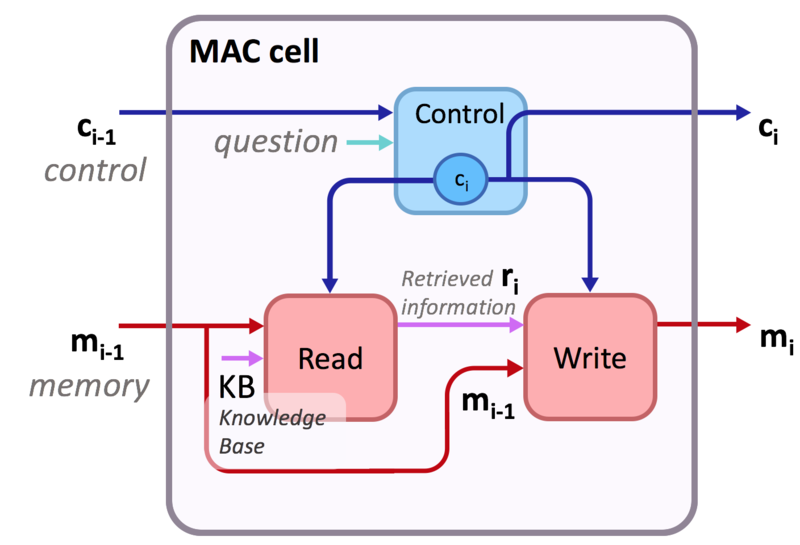 We present the MAC network, a novel fully differentiable neural network architecture, designed to facilitate explicit and expressive reasoning. We introduce a general-purpose conditioning method for neural networks called FiLM: Feature-wise Linear Modulation. Existing methods for visual reasoning attempt to directly map inputs to outputs using black-box architectures without explicitly modeling the underlying reasoning processes. COG is much simpler than the general problem of video analysis, yet it addresses many of the problems relating to visual and logical reasoning and memory -- problems that remain challenging for modern deep learning architectures. We aim to dismantle the prevalent black-box neural architectures used in complex visual reasoning tasks, into the proposed eXplainable and eXplicit Neural Modules (XNMs), which advance beyond existing neural module networks towards using scene graphs --- objects as nodes and the pairwise relationships as edges --- for explainable and explicit reasoning with structured knowledge. To resolve, such questions often require reference to multiple plot elements and synthesis of information distributed spatially throughout a figure. The web provides a rich, open-domain environment with textual, structural, and spatial properties. Thus, a module for a new task learns to query existing modules and composes their outputs in order to produce its own output.